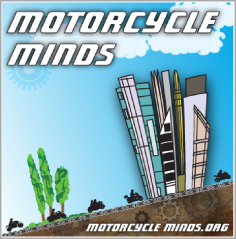 Last year over a 100,000 motorcyclists, coordinated by the French riders group The Fédération Française des Motards en Colère (FFMC – French Federation of Angry Bikers), demonstrated in France against their government’s plans to introduce a raft of road safety policies. The proposal to make the wearing of high visibility fluorescent vests mandatory and the introduction of fines for non-compliance seemed to be the main focus of the French demonstrations. This was reported on and commented on by riders in the UK and Ireland. After the demonstration, (which saw piles of high viz vests burned in protest by riders), French Government Officials claimed that bikers had totally misunderstood the proposed obligation for all to wear a fluorescent high visibility yellow vest! Officials stated that it has never been a question of wearing that vest but rather to propose (not impose) to bikers that they wear a little yellow strap around their arm so that they can be better seen by motorists. However FFMC now report that a new decree (NOR: IOCA1126729D No. 2012-3) on road safety has entered into force. It was published on January 3rd 2012 and entered into force on the 4th January (2012). The decree provides that drivers and passengers of motorized two-wheelers (2WD) of more than 125 cm3 from 1st January 2013 must wear a retro-reflecting device with a total surface area of at least 150 cm ². If riders fails to comply with the law they will be subject to a fixed fine of €68 which automatically leads to the reduction of two points from their driver’s licence. There is no mention of what the passenger faces for non-compliance, perhaps just a fine? Further to these regulations and digging a bit deeper, it would appear that not only motorcycle drivers and passengers must comply but also those driving a vehicle of category L5e with an output exceeding 15 kW. The European definition of an L5e vehicle is one with three symmetrically arranged wheels fitted with an engine having a cylinder capacity of more than 50 cm3 if of the internal combustion type and/or a maximum design speed of more than 45 km/h, in other words, a Trike. The reflective device must also correspond either to French standards or other standards to ensure an equivalent level of safety. These standards are not published, although the characteristics are to be established by order of the Minister for Road Safety. If the reflective device is not built into the original garment, it can be superimposed (we assume fitted/worn) by any means. The device must be worn on the upper body, with the exception of the helmet, from the belt line of the shoulders, so as to be visible to other road users. It must be worn when the vehicle is running or when the vehicle is being fixed on the roadway, or as the result of an emergency stop. This year the political elections are due in France and “noises” coming from FFMC suggests that they are not finished with this issue. At Right To Ride we wonder if riders visiting France will have to wear a reflective device; where riders will be able to purchase these; how much these reflective devices will cost and who will make a huge profit from selling these to 3.5million registered PTWs in France (Powered Two Wheelers – Motorcycles – Scooters – Mopeds – 2009 ACEM). Meanwhile in the Republic of Ireland, MAG Ireland has published interesting preliminary results of their survey on Hi Viz. These results suggest that riders are very aware of their own mortality and that the majority take necessary precautions. Perhaps the French (and Irish) authorities should spend more time consulting riders instead of mandating ridiculous arm bands (or vests). When a government starts interfering with the clothing of a minority group, there may be trouble ahead. Last minute: Manuel Valls suspends wearing yellow armbands bikers!! Manuel Valls announced the suspension of the obligation to wear the reflective armband at January 1, 2013, Tuesday, November 27 at the National Council’s road safety (NCRP). Another victory for the French Federation of Angry Bikers (FFMC). As of 1st July 2012, it will be compulsory to carry a breathalyser in the car with you when driving in France. The new regulation comes into force on 1st July, although it will not be enforced until 1st November 2012, when if you fail to produce a working breathalyser, you will be given an on the spot fine. Only NF approved breathalysers meet the legal requirement. French law specifies that one breathalyser must be produced, but it is generally recommended that you carry two in case you use or break one. The Alcosense Single Use Breathalyser is NF approved and comes as a twin pack in case you need a spare. All drivers and passengers of a motorcycle over 125cc or a motor tricycle over 15 KW/h must wear reflective clothing when riding their vehicles. 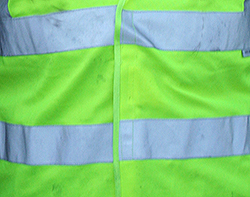 In the event of an emergency stop, the reflective clothing still needs to be worn. The ‘reflective clothing’ must have a minimum reflective surface of 150 sq. cm (approx 23 sq. in.) in total either in one piece or in several pieces, and must be worn in the upper part of the body (between the neck and the waist). A fine will be imposed for non compliance. As far as we are aware there is no requirement for a rider to wear Hi Viz while riding in Spain. Although these say that there should be one for each person in a car there is no mention of motorcycles – rider/pillion. Better safe than sorry and carry them. Situation regarding Hi-Viz for Spain ? Thanks Fergus have you passed this onto MAG Ireland who are involved in lobbying and discussions with the RSA on this? Which seems to at odds within the sentence you say there will be complusory hi viz for all two wheelers and it is already enacted in law, would that be for learner riders at present? If you read the MAG Ireland articles (which we have linked and reported on at various stages on Right To Ride EU) on this it is not just about the type of jacket but whether it will be enacted as the RSA have said that there is a high percentage of hi viz being worn so it may not be made mandatory. Of course that is what the RSA have said. 4.4.4 The Motorcycle Safety Action Plan will seek to address the variation in wearing rates and improve overall rates, especially outside the larger cities and to reduce the incidence of obscured high visibility clothing. 4.4.5 The Motorcycle Action Plan proposes the introduction of regulations for the mandatory wearing of high visibility upper body clothing with full sleeves for rider and pillion passenger. Provide high visibility vests to motorcyclists through promotional efforts with a special focus on regional towns. Promote the importance of not obscuring high visibility clothing. Encourage the use of rear-racks or panniers or other means in order to ensure high visibility, especially when viewed from the rear. Continue to participate in national campaigns to provide high visibility wear to motorcyclists, supported by media campaigns to increase wearing rates. However would be interested in viewing your article, have you a link or details on the publication it is in? Ireland WILL have, from the later end of 2014 compulsory hiv viz clothing for all two wheel users..It is already enacted in law..The consultative process referred to by the RSA (Road Safety Authority) is for the type of jacket style ONLY.. This information i received from the RSA during the course of an interview for an article i was writing..I also received conformation from government sources on this. FFMC, the French member organization of FEMA (Federation of European Motorcyclists Associations says it successfully fought against plans of the government to impose the mandatory wearing of yellow high visibility jackets on motorcycles. The original plans were replaced by the mandatory wearing of 150cm² reflective material as from 2013, which could be accomplished via the wearing of a fluorescent armband. FFMC’s Frédédric Jeorge states/informs, “instead a new decree requires the wearing of 150cm² of reflective material. “It can be included in the jacket itself (like most new ones already have), and if not, be for instance a simple 2 € armband to be worn above the jacket. We still oppose that decree, because of the completely disproportionate penalty for not having one: 2 points out of the 12 of the license (6 for beginners) and 68 € fine. We may add that in France, we ride with the headlight on and the helmets are already supposed to have 4 reflective stickers, one on each side. If not you may be fined as if riding bare-headed, hence our cautious approach for any new regulation in that area. The enforcement date of the new decree is 1st of January 2013. It only applies to motorcycles above 125cc and it would also apply for riders from abroad travelling through France. The next big demonstrations have already been announced to take place on 24th March. 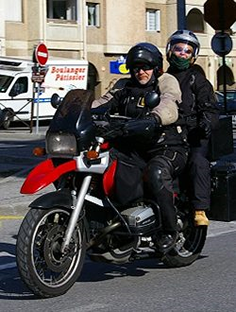 Thank you for posting information regarding a petition in relation to the recent legislation in France regarding the mandatory wearing of reflective strips or armbands for motorcyclists and scooterists (using a vehicle over 125cc). I will not sign that petition for reasons that I intend to explain. You are of course fully entitled to your opinions and here at Right To Ride we celebrate diversity and debate, because it is only through debate and discussion that a common purpose and “meeting of minds” can come together in order to understand the issues. However – back to the issue. Why won’t I sign the petition that has been put up by Jon Wilmer of the Wycombe MAG group. The purpose of these petitions are with the proviso that if they get at least 100,000 signatures, they will be eligible for debate in the House of Commons. The specific demand (leave aside the justifications for it) is “We the undersigned urge the British Government to put pressure on the European Commission to discipline any member state that imposes clothing standards on motorcycle riders”. The second paragraph which justifies this demand states “We view any such requirement as an expression of prejudice against motorcyclists and a barrier to the free movement of people within the EU.” This is then followed by paragraphs questioning the judgement for legislation by other countries regarding Hi Visibility clothing and so forth. What seems to be confusing is that you appear to want the UK government to act (or rather ask the Commission to) against the present system of clothing standards which the EU (under the General Safety Product Directive as well as other standards such as CEN etc) has already set out along with a system whereby citizens are entitled to complain to (RAPEX), which ensures a minimum level of safety and protects consumers (in this case motorcyclists) throughout Europe. You then go on to to qualify the above with a vague statement about Hi Viz – not specifically mentioned France or Ireland You state “With regard to the current proposals on mandatory high visibility clothing being considered by some member states, we consider this to be ill advised and naïve”. In the first instance in France the legislation has already been enacted on January 4th 2012 and will come into effect next year. This is in regards to an area of the size of a piece of toilet paper, which may be or not – reflective strips – or an armband – although this has not been clarified – but it is no longer a proposal, thus the qualification you offer is inaccurate. The other country considering this (though there may well be others) is Ireland and as the RSA has repeatedly stated, this is up for consulation, IOW it is not cast in stone. Although I suspect that you did not bother to contact MAG Ireland for clarification. Demanding through a petition that the UK government tell the EU Commission to discipline any member state that imposes clothing standards on motorcycle riders, is not the same as demanding that the UK government tells the EU Commission that it should discipline any member state for imposing Hi Visibility clothing. Thus the premise is flawed and the waffle that follows is inaccurate. My personal view is that this and the other petitions that have been instigated by motorcyclists and the UKIP MEP Marta Andreassen are misleading. Some with spelling mistakes and bad grammar, but that have had the effect of making the motorcycle community as a whole, appear to be uneducated, ill advised oafs. This is my opinion, it is not personal, it is professional. You are of course welcome to rebut. We do not bar people from posting on this website – with of course the caveat as set out in our disclaimer. Indeed – all sorts of interesting stuff out there as to why car/van/truck drivers look but do not see (motorcyclists, pedestrians, bicycles). Mandatory hi viz blames the rider entirely for not being seen and reinforces this flawed perception. Cognitive and inattentional blindness as well as the eye’s physiological blindspot and the physics of looming probably explains most of SMIDSY. Hi viz ain’t gonna fix that. Well done MAG my Aunt Fanny! The whole process of petitioning is flawed simply because even if the quorum of 100,000 is reached, it still has to go to parliament to be debated. In any case, why would the UK government (which has already stated that they have no intentions of introducing mandatory Hi Viz for motorcyclists) want to pronounce on legislation in other EU countries? The petition asks the UK government to put pressure on the EU (who in the EU? parliament? Commission? van Rompey?) Isn’t this just a little vague? And why ask the UK parliament to pronounce on this? Wouldn’t it be far more productive if the MAG UK General Secretary got off his arse and went to speak to somebody at the DfT about all this – or just a thought – get him to discuss the matter with FFMC and/or MAG Ireland to coordinate action? PS – the Irish government has not decided on legislating Hi Viz in 2014, the RSA stated that they intend to do a consulation before considering legislation. So why hasn’t MAG UK supported MAG Ireland by disseminating the findings from their survey on Hi Viz? Wouldn’t that be more useful instead of trumpeting about useless petitions? So this could make a difference well at Right To Ride we doubt it. Make it compulsory for riders of motorcycles, scooters and similar vehicles to wear high visibility clothing such as, but not limited to, high visibility jackets, waistcoats or “Sam Brown” belts. Further that the Government presses manufacturers of motorcycle clothing to incorporate, at the design stage, high visibility and reflective materials. We petition against any legislation making the wearing of day-glo, reflective clothing compulsory for motorcyclists and their pillions. Ireland plans compulsory, full sleeve day-glo jackets for riders and pillions, France is debating compulsory reflective day-glo clothing. In UK, headlights are already compulsory for most motorcycles, and still careless drivers pull out in front of them. High vis jackets will make no difference to motorcycle accident rates. We say the blaim should NOT be passed on to the victim and wearing of reflective clothing should be a matter of choice, without prejudice. The new Type Approval and Market Surveillance Regulation that will see the introduction of compulsory ABS, the sealing of powertrains from airbox to the diameter and aspect ratio of the rear tyre, restrictions on the aftermarket industry, possible roadside checks by police or other government agencies to inspect emissions or for owner tuning etc. There’s EU funded development of electronics to control and govern speeds either through warning systems or actual throttle control and monitoring of driving behaviour, and the plans in Ireland for compulsory, day-glo jackets for riders and pillions. Riders may be stopped and checked. As with France, where reflective clothing is being debated, the onus shouldn’t be on the victim. Will insurance companies start saying that because we weren’t dressed in day-glo it’s our own fault that an inattentive driver drove into us? Motorcycles and scooters are part of the urban transport solution, not problem. Sign away to your heart’s content, but will it make a difference?? We the undersigned urge the British Government to put pressure on the European Commission to discipline any member state that imposes clothing standards on motorcycle riders. We view any such requirement as an expression of prejudice against motorcyclists and a barrier to the free movement of people within the EU. With regard to the current proposals on mandatory high visibility clothing being considered by some member states, we consider this to be ill advised and naïve. We challenge the speculation that high visibility clothing will reduce accidents involving motorcyclists. We question the right of motorists to hold driving licenses if they are incapable of seeing a rider and motorcycle unless clad in high visibility clothing. Who the hell has got their hands on power in France? Where do ridiculous ideas like this get generated and take hold?